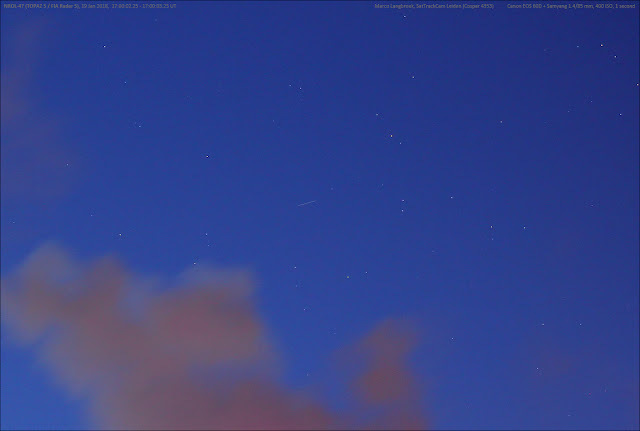 The small streak in the center of the image above in a bright blue, partially cloudy twilight sky, is TOPAZ/FIA Radar 5 (2018-005A, 43145), the NROL-47 payload (see a previous post) imaged in evening twilight of 19 January 2018 with the sun at only 8 degrees below the horizon and the satellite at 24 degrees elevation in the northwest. NROL-47 was launched on 12 January 2018, a week before the photo above was taken. Shortly after launch, Cees Bassa and Scott Tilley already detected the payload by radio, determining a preliminary orbit from the Doppler curves with an orbital altitude near 1057 km and inclination near 106 degrees. The first optical observations were done in the evening of January 14th, two days after launch, by Cees Bassa in the Netherlands, after which it was picked up by a number of other observers as well (amongst others Leo Barhorst in the Netherlands, Greg Roberts in South Africa and Paul Camilleri in Australia). The latest optical observations have improved the orbit for this new satellite and show it is in a 1048 x 1057 km, 106.0 degrees inclined orbit. The payload was making very low (11-12 degrees maximum elevation) twilight passes in the north during the first few days after launch for my locality, where I have obstruction from buildings. Passes gradually climbed higher in the sky over the week, but also deeper into twilight. Combined with dynamic weather, I started to lose hope of imaging it, but finally was succesful in the evening of 19 January. I had a 24 degree maximum elevation pass in the southwest near 17h UT, with the sun barely 8 degrees below the horizon. The pass was high enough to clear rooftop level near culmination. The weather was again very dynamic that evening, with fields of clouds forming as soon as the sun set. Using the 1.4/85 mm lens, I took a series of images while clouds were moving in fast. Due to the very bright sky background, I was restricted to 1 second exposures at 400 ISO. After a first quick cursory check of the images on the camera's LCD screen I initially thought I had lost the battle against clouds and twilight. But upon a more thorough inspection on my laptop a day later, it turned out it was in the images after all, and with enough reference stars to get some decent astrometry from the images. The payload is in a new orbital plane for TOPAZ/FIA Radar satellites. 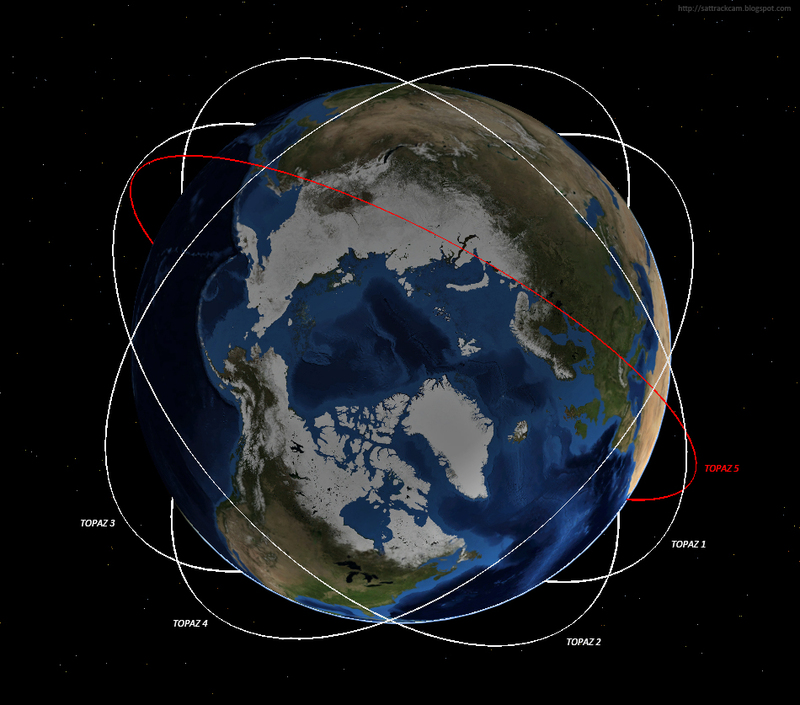 While all previous four TOPAZ/FIA Radar satellites are in a 123.0 degree inclined orbit, this new TOPAZ/FIA Radar 5 is in a 106.0 degree inclined orbit. I had already inferred a new orbital plane for this satellite pre-launch (see a previous post), based on the launch azimuth, which deviated from that of previous TOPAZ/FIA Radar launches from Vandenberg. The new 106.0 degree orbital plane is within 2.5 degrees of my original pre-launch estimate. The orbital altitude is somewhat lower than I initially estimated. 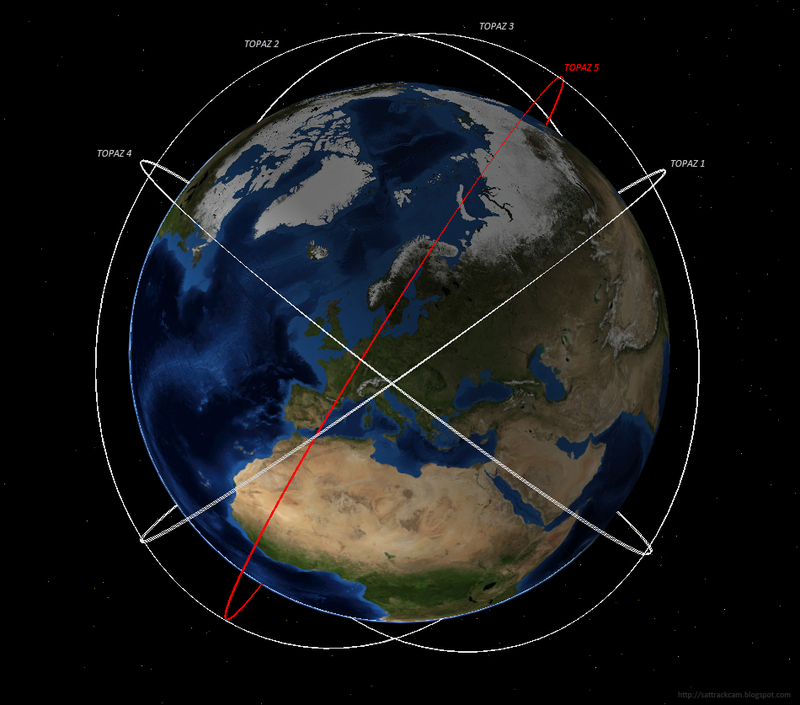 Operating in two orbital planes was also the case of a previous series of radar satellites, the Lacrosse (ONYX) satellites, of which currently only Lacrosse 5 is still in orbit. These operated in two orbital planes, at 68 and 57 degrees orbital inclination. The 123.0 degrees orbital inclination of TOPAZ/FIA Radar 1 to 4 is the retrograde equivalent of the 57 degree inclination of the Lacrosse constellation. The new 106 degree orbital inclination is however not the equivalent of a 68 degree inclination. The current TOPAZ/FIA Radar 5 orbital altitude of 1048 x 1057 km is slightly lower that that of the previous four TOPAZ/FIA Radar satellites, which orbit at ~1100 x 1110 km. However, it is not unlikely that over the coming weeks the orbit will be further raised to a similar altitude. Unfortunately, I am now losing visibility of the object as the higher passes occur deeper and deeper in twilight. TOPAZ-5 is the last of the block I TOPAZ payloads. The new 106.0 degree inclined orbital plane might be the new orbital plane for the block II payloads to be launched over the coming years.